For years schools have departmentalized subjects into independent silos. Departmentalization has proven to be successful in some instances for students and teachers when implemented to fit the needs of the learner. But as education is examined from college to career, more and more organizational structures realize that many subjects are deeply intertwined. Businesses at their core need today’s students to be able to harness science, technology, engineering, arts and math to drive innovation. Innovation is at the heart of business development in our nation and in our world. STEM is an acronym for Science, Technology, Engineering and Math education. STEAM goes one step beyond by adding in a focus on the arts. We focus on these areas together because the skills and knowledge in each discipline are essential for student success. STEAM focuses on real world problems and issues and in how students learn most effectively. 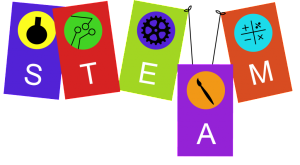 STEAM is an interdisciplinary and applied approach that is coupled with hands-on, problem-based learning. STEAM helps teachers and students recognize the interconnectedness of different content areas. When students can connect the dots between disciplines it awakens their understanding of relationships and builds their motivation and love for learning. STEAM bridges content to other disciplines in order to deepen understanding and connect learning for learners. STEAM promotes global awareness and real world relevance. STEAM helps learners develop critical-thinking and problem-solving skills. Students enjoy learning hen they can connect it to real world scenarios and problem solving. They want to be able to make a difference in the world. Given real world problems, they take ownership of their learning and begin to make meaningful connections between school, community, work and global issues. STEAM encourages learners to ask questions, think creatively, develop and test innovative ideas, synthesize knowledge, and draw conclusions. STEAM helps learners exercise and communicate sound reasoning; understand connections; make complex choices; and frame, analyze, and solve problems.